Especially if they have been in the business for some time. This is why we always recommend our clients to create an ideal customer avatar before they start creating their ads. However, this is just step 1. And for each level of awareness, you need to craft offers and ad messages specific to that level of awareness. Let me give you a quick example of one of our client’s campaigns. 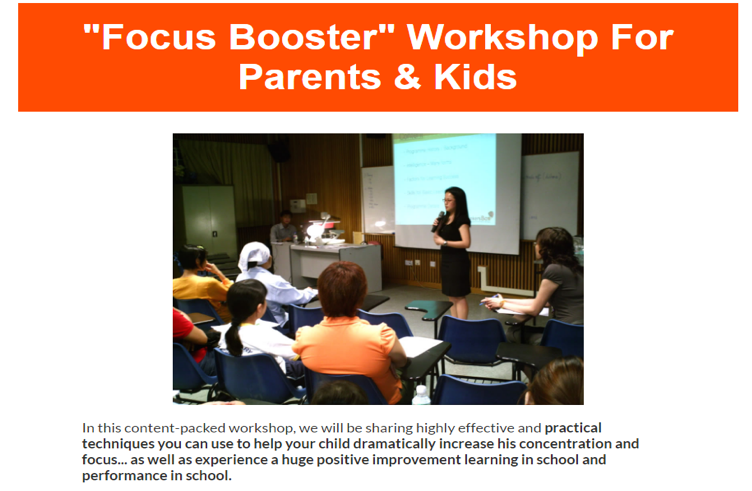 We created a “Focus Booster” workshop for ThinkersBox, a brain development centre here in Singapore. To ensure that we can target the widest market possible, we created ads for each level of awareness. 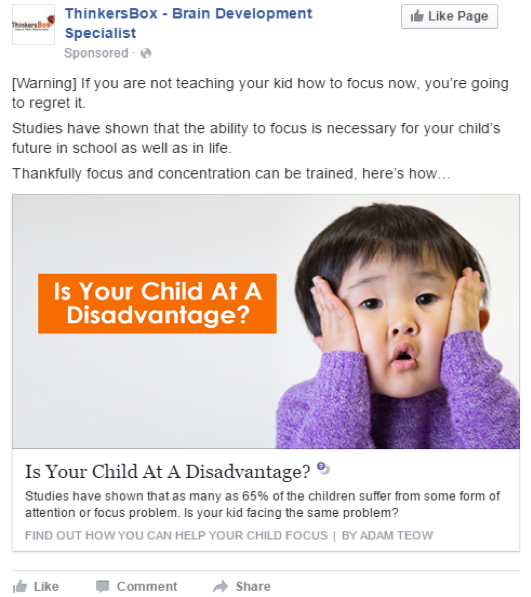 For the unaware market (AKA people who don’t know their child have an attention problem in this case)…. We used messages that will catch the market’s attention. For example, we know from interviewing parents that their biggest worry is that their child will “lose out” to other children in the same age. At this level, the market knows they have a problem and are actively looking for a solution. To “call out” to them, we created ads that highlight the pain that the parents are experiencing. At the “Solution Aware” level, the market is aware of the different solutions and options they can use to address their problem. 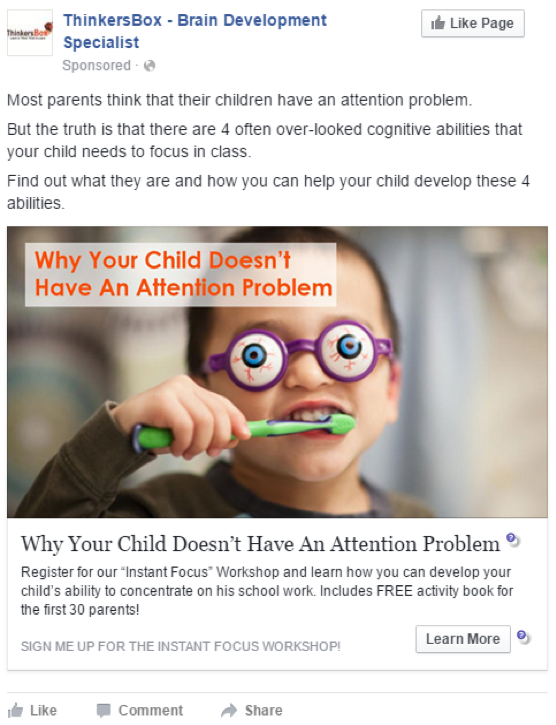 In this case, we’re talking about parents are already aware that their children have an attention problem and are actively looking for brain training to help their child. This means that they’ll probably not pay much attention to the previous ad. 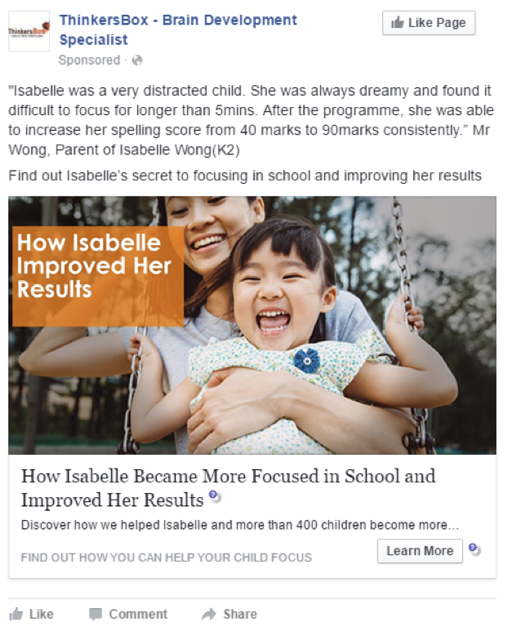 We’ll introduce the 4 types of cognitive (brain-related) abilities that need to be developed in order for the child to focus and pay attention in school. Highlighting any special discount, deals and/or bonuses. 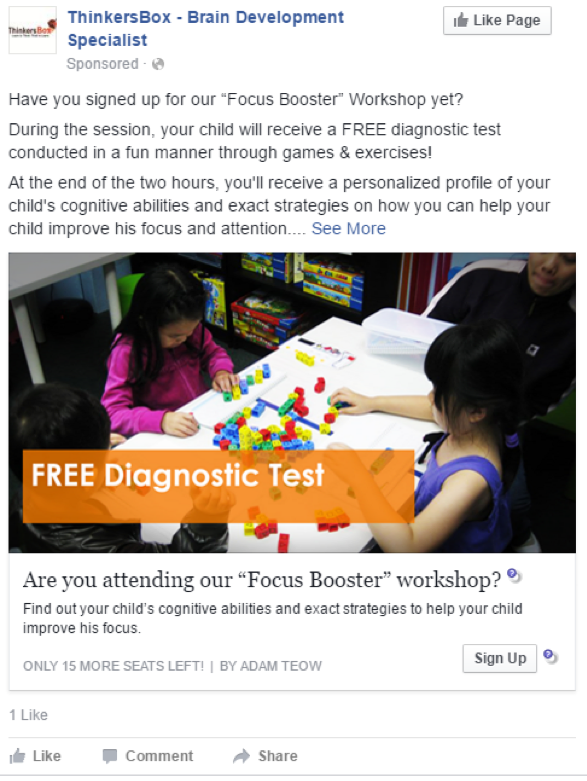 For the ThinkersBox campaign, we did a retargeting campaign where we remind parents about the FREE diagnostic test that is included in the workshop. Now, let’s talk about the “Most Aware” market. But for some reason, haven’t taken action on your offer. In this case, we’ll focus on selling the brand personality and appealing to their emotions. The best way to do this is through stories like this one about one of the students in the centre. The Result Of The Campaign? 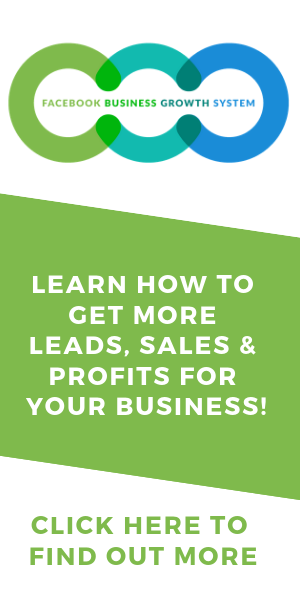 Within 3 weeks, we were able to generate over $39,200 of sales on a $2,400 ad spend. That’s a 1,600% return on advertising spend (ROAS)! Simply by matching the ad message to the market’s level of awareness. And this is just the result from using take one of the “4 core pillars of advertising”. 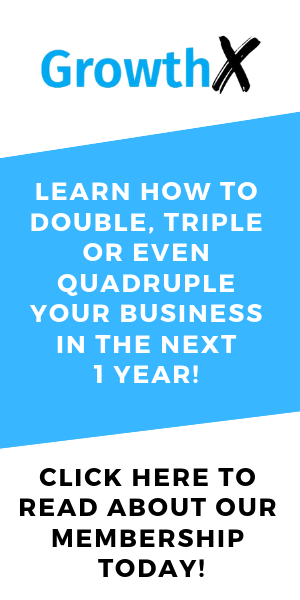 If you want to consistently churn out profit-sucking campaigns like clock-work.